Joon-Yee Chuah is a math teacher in Austin, TX who has a culinary science and anthropology elective for 6th grade students. You can read about his misadventures at his blog: http://whyhenrycooks.blogspot.com/ or you can view pictures from Kitchen Day 2 on Picasa. Hi, everyone! 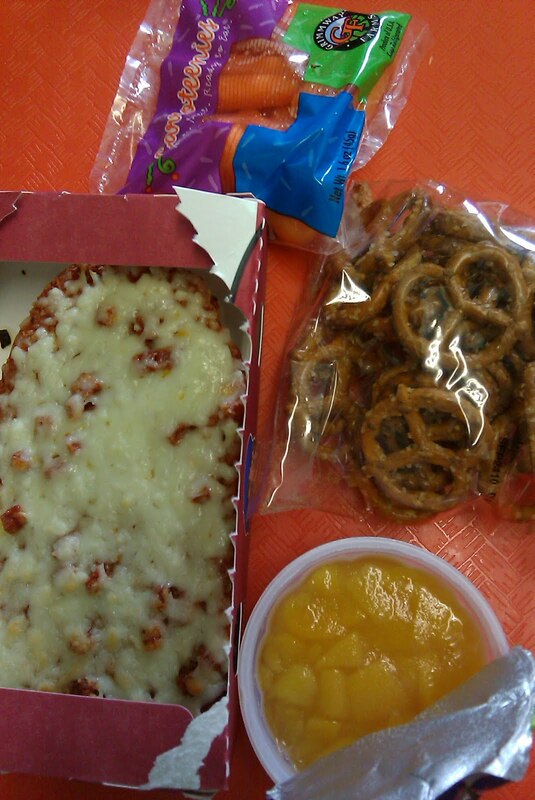 I’ve been reading this blog for a while and instead of posting a story about what goes wrong with school lunch, I thought I’d write about an experiment that takes us in the other direction. 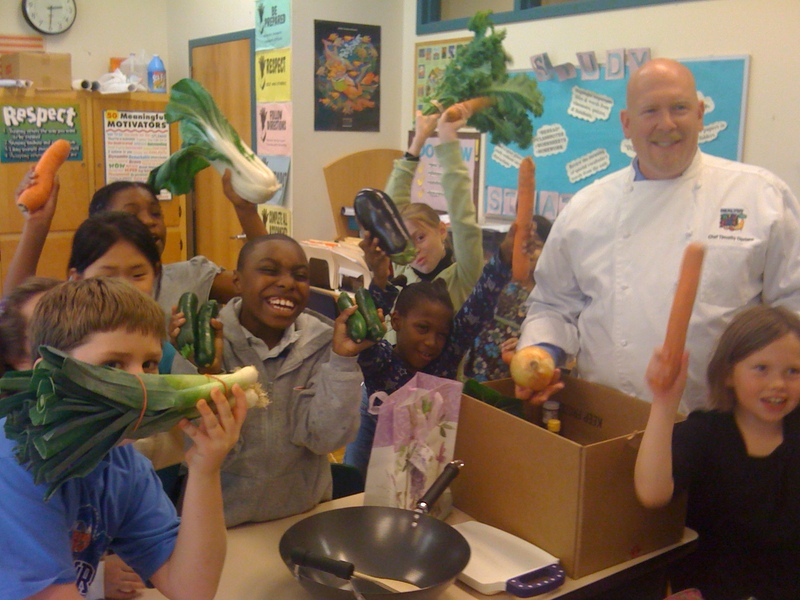 I teach a culinary science and anthropology elective to 6th grade students in Austin, Texas. I have two classes, one with 30 students and one with 20. Each class meets for two hours around lunch time. Once per six-week grading period, the home economics teacher graciously allows us to use the kitchen laboratory to cook a meal. I call this “Kitchen Day.” This is the first semester I’ve taught the course. I am not a culinary professional by any means (unless you count burger flipping when I was 16) and I resent being called a “foodie”, but I love cooking and I love teaching kids. Therefore, I’m willing to try something as crazy as having thirty students in a kitchen at once. As part of the preparation for Kitchen Day I had my students research what an appropriate serving size of each course should be. They determined that the serving sizes were one ounce of salad, a half cup of rice, three ounces of chicken and a half cup of cooked asparagus. What about the mushrooms and the cinnamon rolls? Well, mushrooms don’t really have anything but dietary fiber so we based our serving size off of “what looks good on a plate” rather than how much mushroom an individual should be served. As for cinnamon rolls, no kid wants to eat half of a cinnamon roll. However, we made the actual cinnamon rolls rather small – about two inches in diameter. This continues to be the most challenging part of Kitchen Day. The smaller of my two classes always seems to be more competent in the kitchen. Perhaps it’s because they have more home kitchen experience, but most likely it is because I can provide more individual attention as a scurry about from group to group. The kitchen laboratory in our school has industrial sinks, three ovens with stove tops, portable electric ranges and a good 50 feet of counter space. Students are broken up into groups by recipe or task and given a space in which to work. Somehow, this still manages to feel somewhat inadequate especially during the class period where I have thirty students. The top priorities for students in this environment are safety and cleanliness. We do a fair amount of safety and sanitation training and establish a culture of safety awareness before entering the kitchen, including rearranging the tables in my classroom to resemble the real kitchen’s layout and role-playing everyone’s task. We also establish procedures for how to safely move about the kitchen, handle knives, heat and raw meat. I always get a kick out of watching the kids in action carrying around a hot pan shouting, “Hot, behind you, coming through!” and having everyone else scurry out of their way. Students must also adhere to a strict dress code before they are allowed to participate. If a student doesn’t pass dress inspection before we enter the Kitchen, they become my personal assistant for tasks outside the kitchen such as setting up the classroom tables for dining. My students come from a variety of cultural backgrounds and have a broad range of kitchen skills. Some of them have parents who have worked in the food industry and make cooking a big part of their children’s lives. Others have never tried some of the vegetables we served today. (As an aside, I have some kind of disability that prevents me from baking and the kids are much better at it than I.) However, prior home experience is not a strong indicator as to how productive an individual will be on Kitchen Day. Why? Because Kitchen Day, with its 1.5 hour cooking time limit, is less like cooking in a home kitchen and more like working in a professional kitchen where mental traits such as flexibility, plasticity, the ability to multi-task and personal work ethic are more valuable than discrete cooking skills. It’s surprisingly easy to teach a sharp student how to sear roast a pan of squash, but it’s nearly impossible to teach any individual how to always be productive and not stand around doing nothing. I have a good friend who is a chef with 20+ years of experience and he says that this is the number one problem with young cooks in my town. I went to a restaurant supply store to purchase the majority of ingredients for my class. The caveat is that everything must be purchased in bulk. We’re not talking CostCo levels of bulk (though I did end up getting some items from CostCo.) This is restaurant bulk. For example, I purchased a case of 40 pounds of boneless skinless chicken breast at $1.25 per pound. (I ended up having to split it with my chef friend.) The biggest surprise to me that occurred during purchasing was the high cost of onions. Due to the strange weather that’s been sweeping the nation, yellow onions were $1 per pound at wholesale prices! My budgetary goal was to lower the cost of ingredients to $2 per student, for a total of $100. I asked the students’ parents for donations of $2 to cover the cost of that day’s lunch. Some of them were not able to provide a donation, but their costs were subsidized either by more generous donations from other parents or by the school. I missed the mark and came in over budget by about $50 after everything was said and done, but I was able to invite a few teachers (whose assistance I could not have done without) to enjoy lunch with the students and I had a decent amount of leftovers. Labor was not a factor. In the business world, it is considered a controllable cost in that a business can decide who to hire, for how long and how much to pay. If I had a single clone of myself, I could probably manage the entire meal for all fifty students within 2 hours, but that wasn’t the point of this experiment. 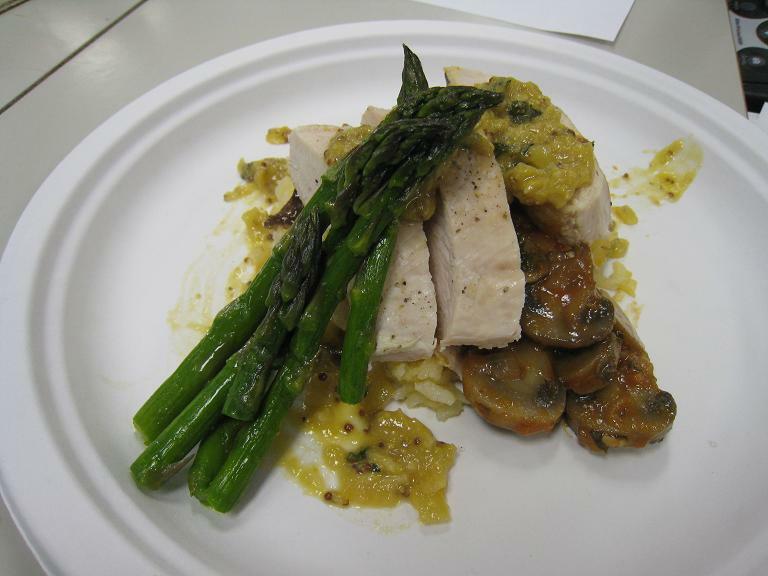 Overall, the students made tasty food that they all enjoyed and the experience was overall a positive one. The teachers who dined with us were impressed by what the students were able to accomplish and really enjoyed the meal. If I were to compare my classes, the larger class always seems to make me pull my hair out a little more than the smaller class. They were not able to successfully make the sauce in time, failed to complete one batch of cinnamon rolls and finished fifteen minutes late. Somehow, the dishwashers managed to use half of a bottle of detergent and all 50 of my kitchen towels and still left pots and pans somewhat dirty. A colleague who assists me on the larger class day says that I frequently resemble Gordon Ramsey in the kitchen. On both days when I get home from school, I usually end up doing any left over dishes, skipping dinner (or eating McDonald’s) and going to sleep at 7pm. Anyway, I hope you all have enjoyed reading my excessively long post. I also hope that it inspires conversation about some of the great things that can be accomplished with school lunch and some of the challenges we have yet to overcome! The pizza doesn’t look too bad today, right? I’ve said it before but the french bread version is better than the plain pizza. The crust is really thick so there is less of a chance that it will got soggy. In fact it holds up pretty well. One of my colleagues/friends saw me with the school lunch and said, “I’ve giving you some of my salad.” Part of her lunch was a cucumber tomato salad with dill and feta. I told her in the nicest possible way, “No. Please eat your own food.” But she insisted so I got some extra veggies. She has seen me get the school lunch a lot (ahem) and I think she might be concerned. Her “bonus” salad was quite refreshing. I don’t know how one would solve the packaging problem without investing money into real plates, silverware and a big dishwasher OR investing money into biodegradable containers. The current containers are sturdy paper sealed with plastic film. They are durable enough to serve cold and hot. Either way we are looking into some kind of major outflow of cash. Can someone with knowledge of the prices do a cost calculation? I am a 25-year-old organic farmer. 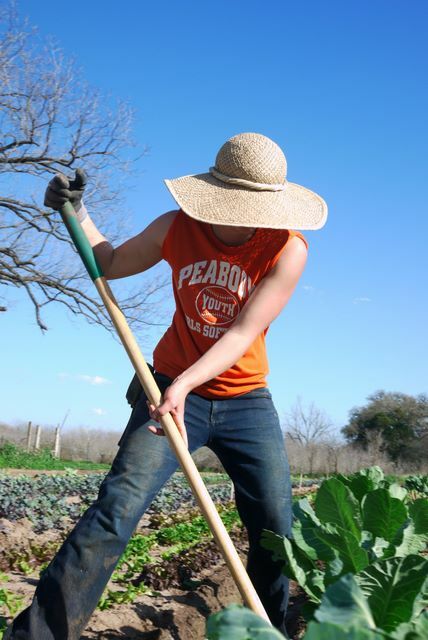 I do not have my own farm, but I work full-time on an organic farm in Austin, Texas. My dream is to own a farm with my fiancée, Travis, and provide organic produce directly to our community. I have been reading Mrs. Q’s blog since she began it, and I am fascinated and excited by how it is resonating. Mrs. Q’s blog is making us think about what we consume. She is joining with figures like Jamie Oliver, Michael Pollan, and even the First Lady who are encouraging a change in the way Americans eat. The takeaway message is clear: it’s time to move from processed, synthetic food to whole foods. This means fruit, vegetables, grains, and naturally-raised animal products. As a future organic farmer, I’m overjoyed by the rising interest in eating fresh food. But I have to ask one question: where will this food come from? The average American farmer is pushing 60 years old. Only 1% of farms in this country are organic. Instead of gaining farmland, American farms are disappearing at a rate of roughly 1 million acres a year. As more farmers reach retirement age and have no one to pass their land to, perfectly good farmland lies fallow on the countryside. The reality of America’s farmers is that over the last few decades, farms have been conglomerated into the hands a few large corporations. They have developed a symbiotic relationship with multinational food producers, which have made food cheap and abundant by making it synthetic and unhealthy. What we have now is a smattering of giant farms that grow a few items, then ship those items around the country and around the world. More often, these food items are not produced for direct human consumption, but for ingredients in processed food products. The most notorious of these is corn, which makes its way into almost all of our processed food. If we are interested in eating fresh food grown in America, we must either fall madly in love with genetically modified corn, or create new local food chains that hinge on diversified organic farms. Before I was interested in farming, I never thought about where my food came from beyond Stop n’ Shop down the street. But food does not come from the grocery store; it comes from farms. And being able to see the path from farm to table is invaluable for understanding and appreciating the food we eat. America’s connection with our food has been dilapidated by the rise of mono-cropping and mass-produced food products. How many reading this know the farmers in their community? How many have ever been to a farm? How many know the growing practices that produce the food they are eating? Choosing organic food from local farms is the surest way to reestablish that connection to our food. This national discussion about food provides us not only an opportunity to begin eating better, but also a chance to seek out the people growing our food and build a relationship with them. Is it enough to simply eat more fruits and vegetables? It’s certainly a great place to start. But my point is that if we all just begin eating more fruits and vegetables but keep the same food-buying habits, that is, buying from nameless food producers with little connection to our communities and even less accountability to them, not much will change for our understanding of food, the health of our environment, or even our personal well-being. If we want to keep the factory, mono-cropping farm model, then as we begin to eat more vegetables, I’m sure these farms will change to meet our demands. But that won’t really give us anything different from our current system. They will still use the chemicals that pollute our environment and stay on our food; they will still consume petroleum at an alarming rate; they will still exhaust the land they farm, rather than stewarding it, and they will still choose to grow varieties for shelf-life and water weight, rather than nutrition and flavor. Even if the current mega farms manage to satisfy USDA organic standards, it still will not give us the kind of change we need. Government-approved organic standards strike me as having about the same usefulness as government-mandated nutrition guidelines. 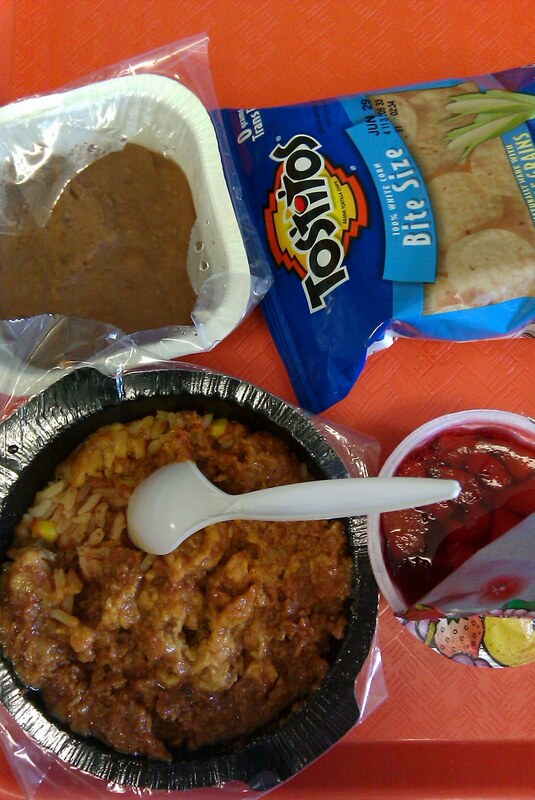 If the lunches Mrs. Q is eating every day satisfies some USDA standard, then something clearly isn’t working. This change should not just be about eating “organic” as a feel-good label, but about building relationships with the people who are feeding us and our families. I’m 25 and I want to farm. 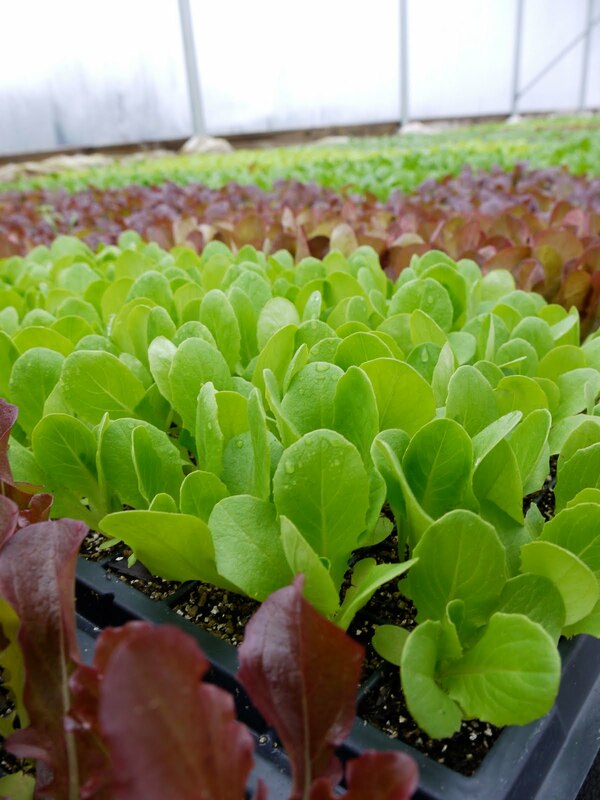 I want to provide my community with fresh produce grown without chemicals. I’ve even thought that a good way to start would be to make a connection with a local elementary school and provide the produce for the school lunches. Wouldn’t that be something. I moved from my life in the city a year and a half ago and I’ve been trying to figure out how to farm on my own ever since. The path to get there is not easy. But if everyone is serious about eating better, it ought to be. There is a small, but passionate population of young people in this country who want to go into farming. It’s up to everyone in this country to decide if they want to support us. Go to farmers markets, support your local farms within your means, join a CSA, encourage legislation and organizations that support start-up farmers and train new ones for the future, and cheer on incentives that help conventional farmers transition to organic. Heck, start by finding the farms in your area, if there are any. There are seedlings of these efforts in certain parts of the country; I hope that we can grow them. Last Spring, Neysa King left a History PhD program in Boston to pursue a career in organic farming with her fiancée, Travis. They first moved to Brewster, New York, just north of New York City, for an internship on a 3-acre organic farm. In November, they moved to Austin, Texas for another internship, where they were recently hired full-time. Their goal is to own a farm of their own, and they’re not sure where they’ll go from here. To read more about Travis’ and Neysa’s pursuit of organic farming, click over to Dissertation to Dirt. Yeah! It’s one of my favorite meals; it’s like real food. I also feel full for a long time after this meal. The beans are good, but I didn’t even open the tortilla chips — there just is no time. The fruit jello tasted yummy. Red dye is tasty. I drank a ton of water today. There might have been some salt in those chips…(I ate them quickly as a snack when I had a short break). I should have taken a snapshot of the ingredient list on the back of the chips package, but I really have such little time. I’m eating as fast as I can and usually I’m multitasking trying to organize some paperwork. I actually sit by a computer when I eat and try to do quick data entry or send an email. Teachers get limited time on the computer for emailing colleagues or the principal, etc. I didn’t realize that the taco meat was turkey until today when I scanned the menu. I do believe that the menu has been updated to share that information. I do scan the menu, but for the most part I avoid it. Just like the kids I get in line and make it a surprise. Today tex-mex was a happy surprise. 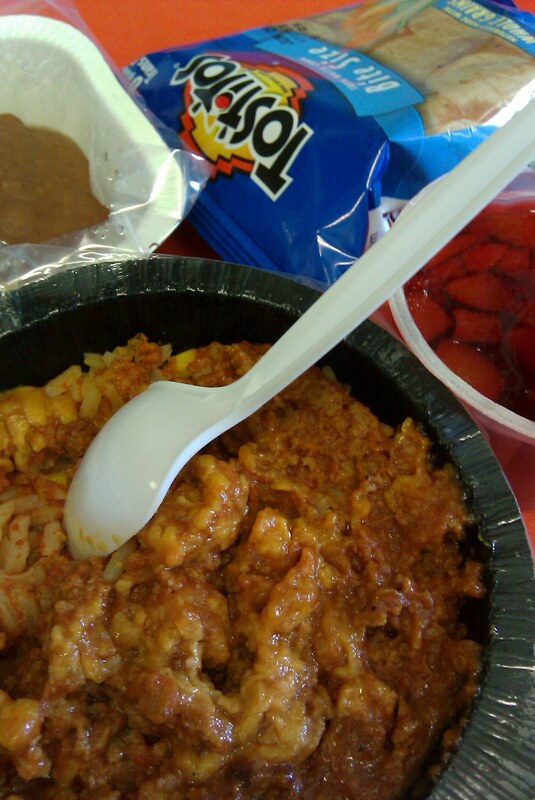 However, I have decided definitively that pasta is my favorite school lunch. And I guess today I was Blogger’s Blog of Note. Thank you for that honor! I’m not going to comment on the lunch as I have eaten this same kind of thing multiple times. All I’m going to say was that as I was getting ready for work last night, I had a brief thought, “What am I going to pack for lunch?” The thought came in and then went out of my head. I sort of sighed. But then I indulged my fantasy of packing my own lunch. It would have been a tuna sandwich, apple, yogurt. I would have made the tuna with one can of chunk light, real mayo and thrown in a handful of raisins. I would have also also put a slice of cheese on the whole grain bread, no, it would be sourdough. And as long as I’m fantasizing, I would have found a way to melt the cheese. There is nothing like a midday tuna melt. A girl can dream. In regards to a reader comment about choice. There is a meatless alternative on the printed menu, but when I go to the lunchroom, it is rarely put out for the kids to grab. The main meal item is laid out. It’s very much an assembly line and from what I have seen of the kitchen and kitchen staff, well, it is run very efficiently. 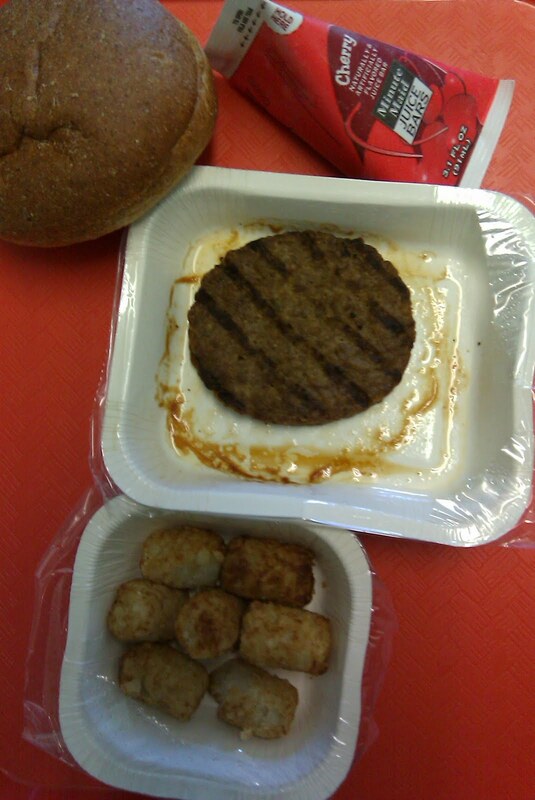 I feel certain that if they had the equipment, those lunch ladies could build a Ford F150 in one afternoon. So, when I come in, I take what the kids get. That’s part of the thesis of my project. And I don’t want to stop the momentum of the lunch line by piping up and saying, “I saw a bean burrito on the menu and if you don’t mind I’d like one of those.” Um, yeah, I want to blow my cover! When I ate the bean burrito, it was because a lunch lady asked me if I wanted it. As a rule I do whatever they say. Just like when they offered me the cheese lasagna, I accepted it. But, recently I was offered the cheese lasagna again. I declined. 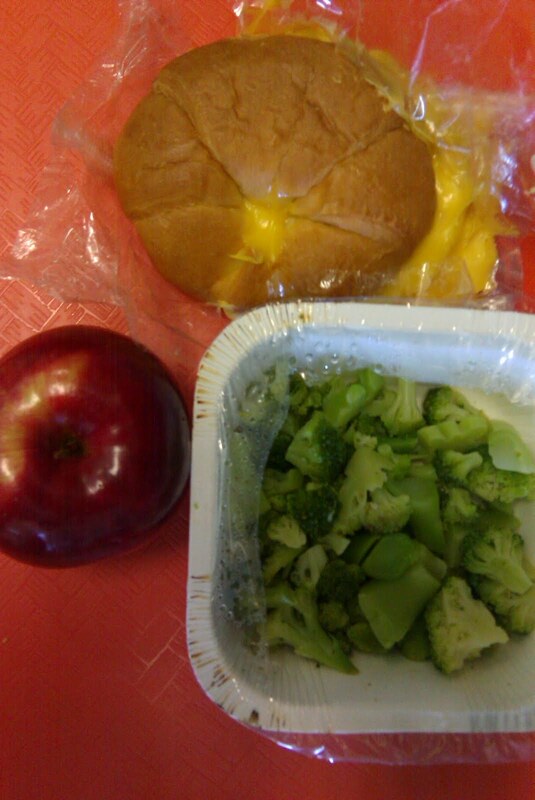 The sandwich was stale, but the broccoli and apple? Great. 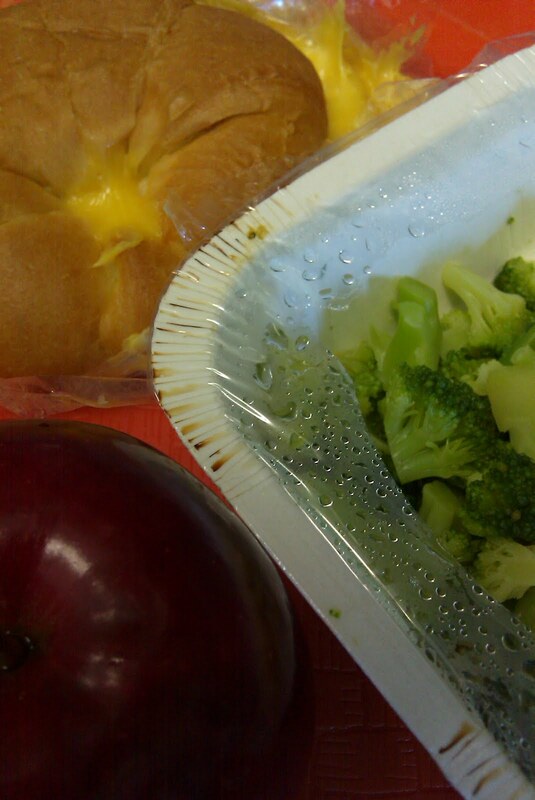 I do believe overall the lunches are getting marginally better! I’m waiting to have a lactose attack because of the sandwich, but it hasn’t happened yet. In regards to the “Meatless Monday” post — before I considered posting it, I sent an email to Ms. Puccini with more questions about the program. 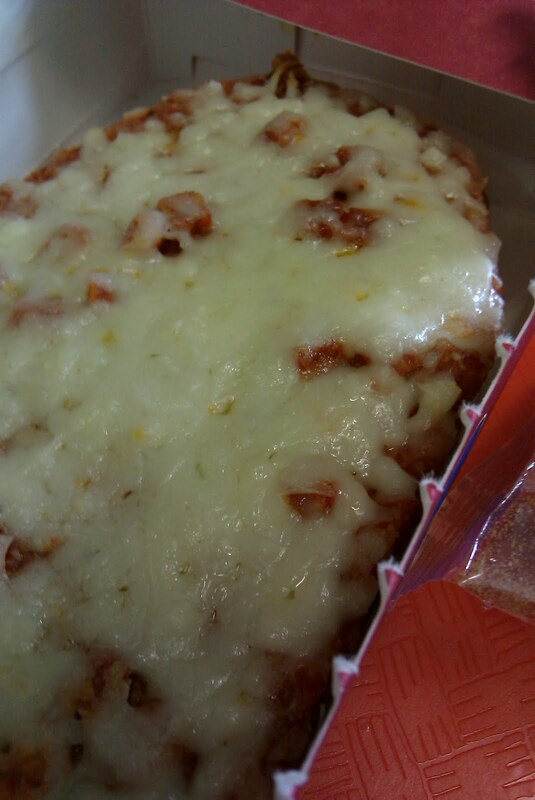 My concern about “meatless” meals is that they are like what I ate today: cheese sandwich with borderline tastiness. 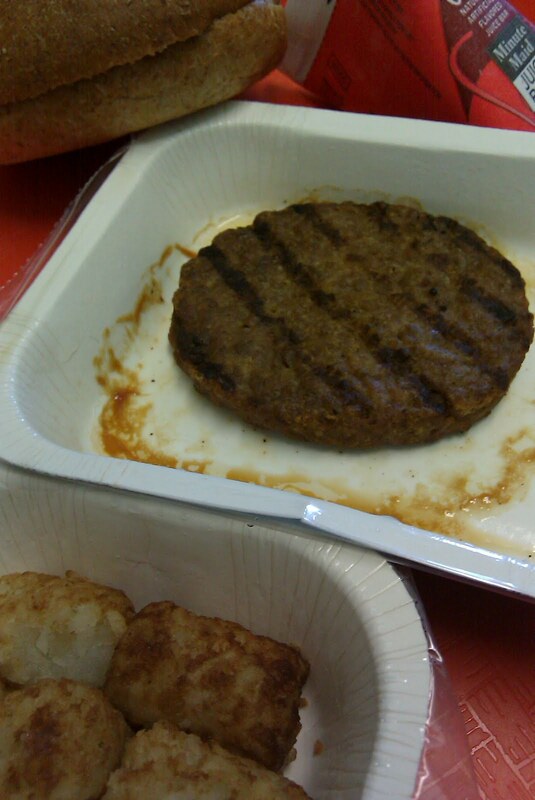 Would I prefer to have the cheese sandwich or a potentially low quality beef patty? Um, I can’t answer that. Her response was similar to what you see in her post. The foods are varied and rich in nutrients. In my house we eat a varied diet. It includes meals without meat like tofu, but our home diet includes eggs, fish, pork, turkey, and bison. I like how Meatless Monday is examining food diversity on the menu, but I also believe there are more animal sources of protein that kids would enjoy too. Also I think that Meatless Monday is a decision by NYC that is right for them. I think regionality is very important when it comes to food. So if they want to do this considering there are few farms in the boroughs and therefore fewer sources of meat available to them, I say go for it. I’m sure it costs a fortune to “import” every food into Manhattan. Every part of the country needs to do what’s right and logical for them. For example, if you live in Montana, at school you should get bison since that’s a local source of animal protein. If you live nearby an ocean, your school menu should include fish. And let’s expand our thinking to include local and seaonal fruits and vegetables. That is how we will save the government’s money. Let’s eat local, which should include tofu AND eggs, fish, pork, turkey, and bison depending on what’s logical for your area. Let’s think out of the box. Bravo to NYC!